We had some things to harvest today! 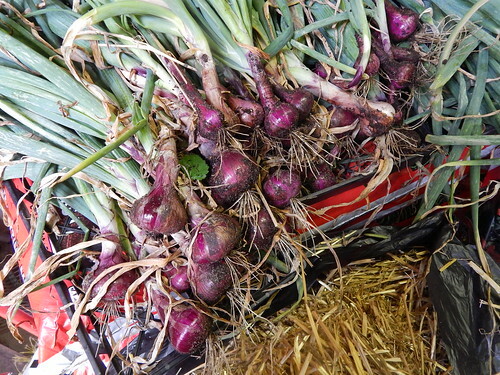 We pulled the cippolini onions, some of the beets, one carrot, and a bunch of mustard greens! ‘Red Marble’ Cippolini Onions. These are supposed to be smaller onions that are a little bit flattened, so they are just about the size they are supposed to be. Not the same size as the big sweet onions for sure! 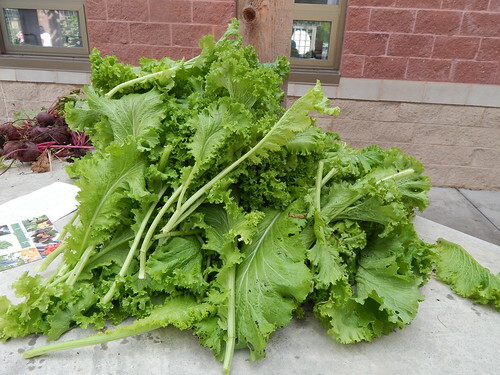 A big ol’ pile of mustard greens! They are starting to bolt, so we pulled a lot of the plants today, leaving just one row down the middle of the bed, under the trellis. 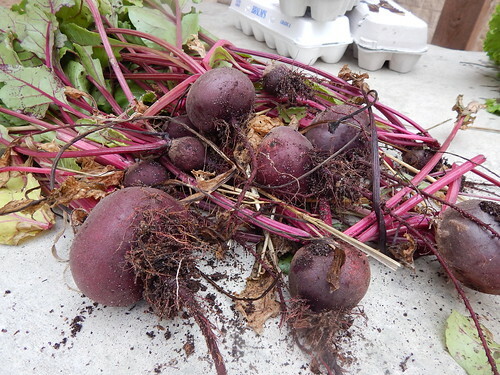 We just harvested a few of the beets, and they are pretty variable in size. Still, given the rough start they had, we can’t complain. I just pulled one carrot to see how they were, and we decided not to pull any more today. 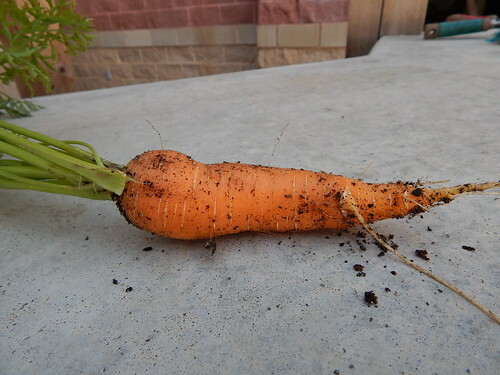 The reason isn’t that they aren’t ready, but because we have a group of kids coming from Rainbows Camp Woodchuck on Friday and we thought they would enjoy pulling the carrots. 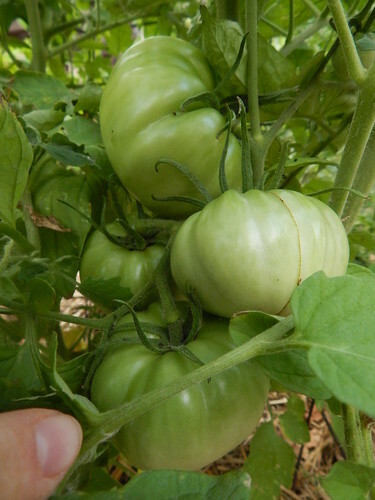 The first tomatoes on the Silvery Fir Tree plants are starting to turn! Maybe they’ll be ready by the end of the week. 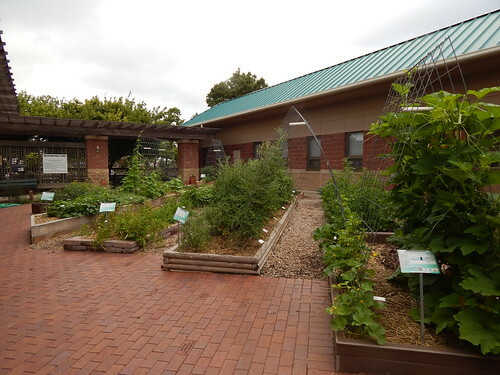 Our next Saturday Sampler will be tomorrow, June 21st from 9-10 a.m. Our theme this month is “Cucumbers Around the World.” Our cucumbers are just barely getting started in the Demo Garden, but I know that we will all have more cucumbers than we know what to do with in a few weeks! We have some really interesting Italian and Indian cucumbers to learn about. 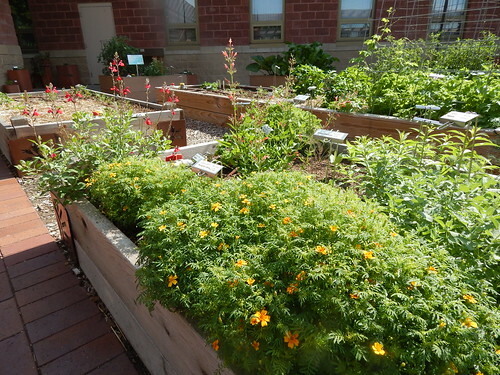 I think the Demo Garden path is paved with my good intentions of posting more frequently. Time just seems to slip away from me earlier in the week! 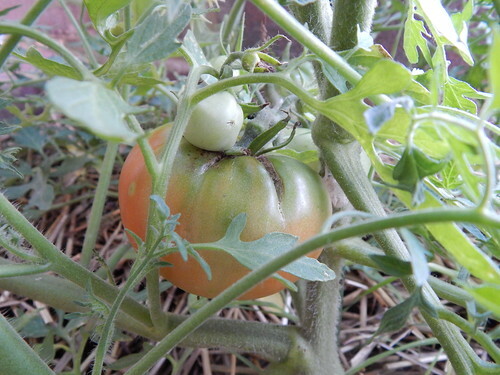 Luckily, the garden does not rely on me to blog regularly in order to grow. We really would be in trouble if that were the case! You can see on the right side of the picture that the pumpkins are doing their best to be the first to the top of the trellis. 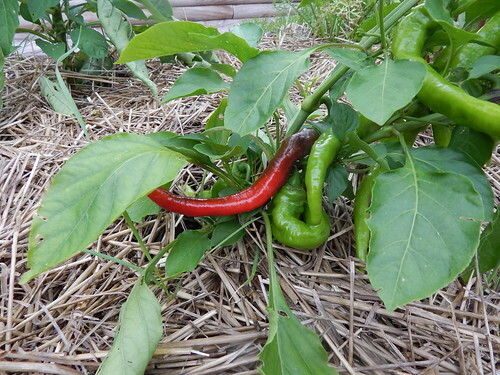 Some of our other cucumbers and vines are just being pokey. 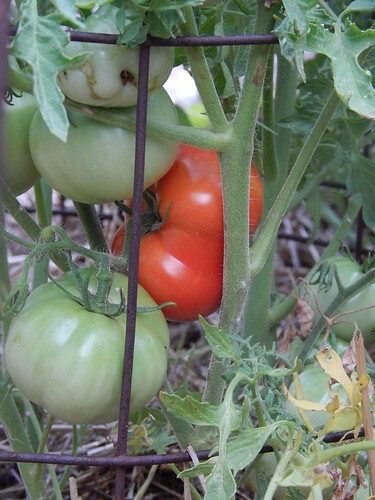 The pumpkins are also doing their best to be the first vine crop with fruit set. They might win! I didn’t see any bees this morning, so I tried to help the cause by transferring pollen from one of the lower male flowers to this female flower that was open. I guess we’ll see if I was successful. We have new babies! Again! 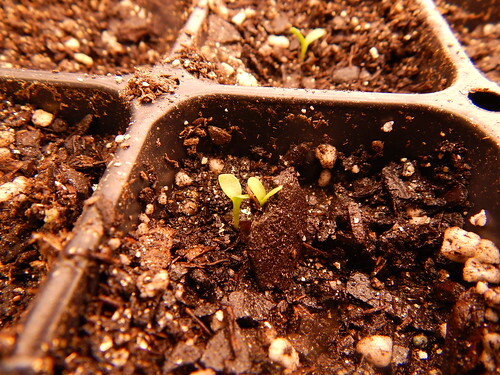 We planted some chicory and onion seeds inside this week, and a few of the chicory are already up. I’m a little surprised, because sometimes chicory can be a little slow. That’s one of the reasons I wanted to start them now rather than in two weeks. They also have a relatively low germination percentage (about 65%), so this way we will be sure to have enough plants in about 6 weeks. 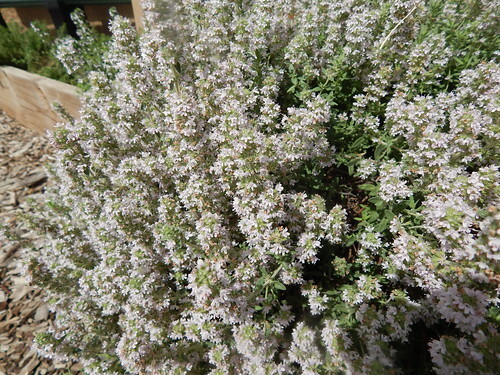 This Rose Scented Thyme is blooming like crazy. It is almost completely coated in pale pink flowers. It is obviously very happy with its location. Also blooming, but not nearly so attractive is this Endive. 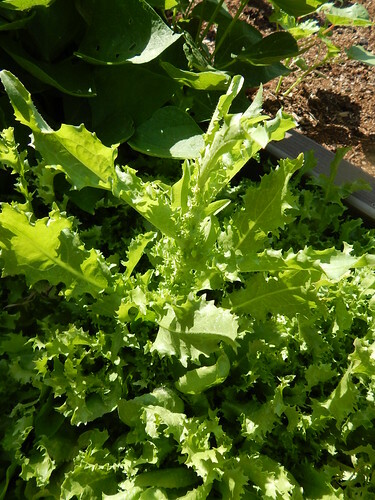 Not all of the endive mesclun plants are bolting, but I’m sure they aren’t far behind. That means we will be pulling them out soon and getting ready to plant the bulbing fennel for fall. 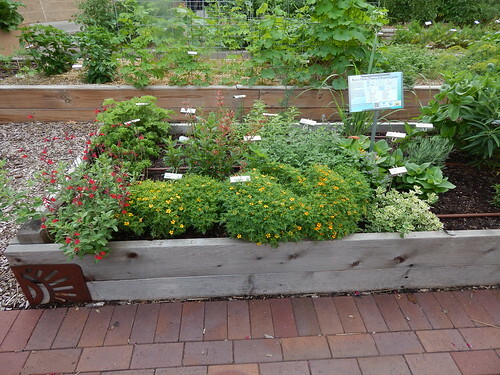 The Herbs & Flowers garden is looking so nice already, and the citrus marigolds are still looking better than they ever have before. I’m going to have to find some recipes using citrus marigolds! 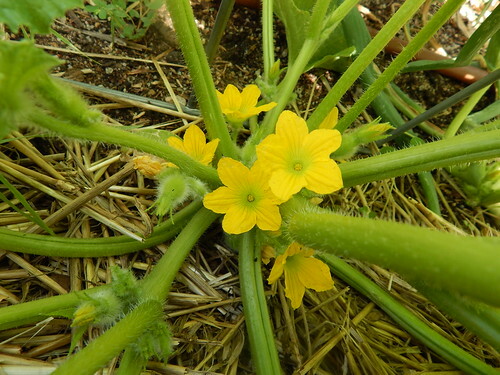 Just in time for our Saturday Sampler this week, some of the cucumbers in the garden are starting to bloom. 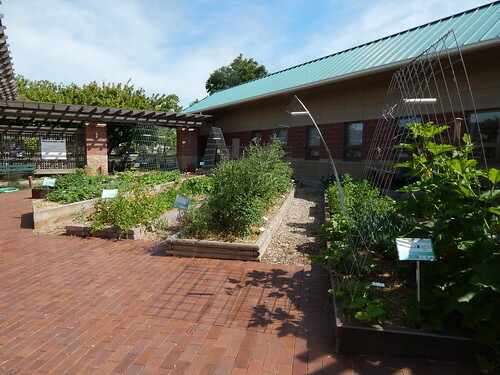 Of course, we were hoping there might be some actual cucumbers by this weekend, but they have been a little bit pokey. This is the ‘Tondo Liscia Manduria’ cucumber-melon that is in the Italian/Vertical garden. It hasn’t really started to vine yet, but it is blooming. Most of these blooms are the male flowers, but do you see those tiny, fuzzy, green blobs? Those are the buds of the female flowers getting started. I’m going to guess that this first flush of flowers probably won’t result in more than one, maybe two cucumbers. Most of the flowers are male, and the timing might not work out to pollinate the female flowers once they open. 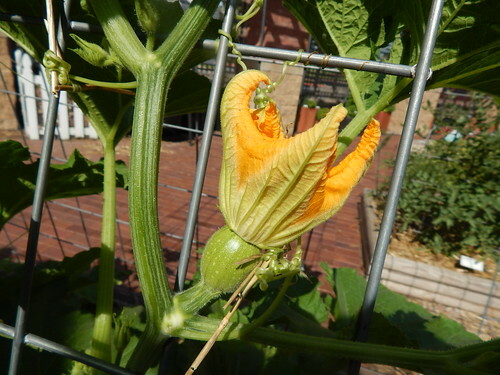 It is very common for this to happen with the first flush of flowers, so if you are starting to see flowers on your cucumbers but no cucumbers yet, just be patient and wait for the flowers to sort themselves out.